What it is, why it is a sought after technology, and the possible implications it has in the future of health care. Anyone that spends time watching TV is familiar with those commercial advertisements for products that claim to use the “latest technology” in order to help an assortment of conditions. This mode of advertising is called “direct-to-consumer” marketing and it works by capturing the target demographic and then provides a service or product via the mail. The allure of these products is strong, and the promised benefits drive sales. It is no wonder that new companies are trying to enter the market to get a piece of the multi-million dollar industry. Advancements in genetic testing practices have allowed companies to market this technology to the public at a competitive, realistic price point without visiting a doctor or other medical professional. This means that a consumer can order an at-home genetic testing kit from a website and receive volumes of information pertaining to their individual genetic profile, again without consulting a doctor. 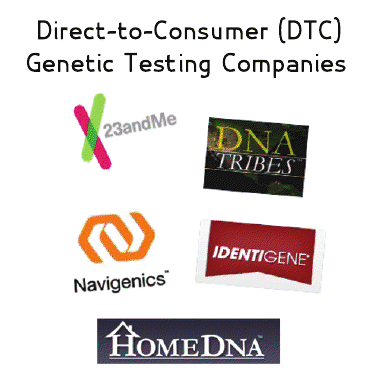 Many of these direct-to-consumer (DTC) genetic testing companies are not FDA approved, partly because the technology is so new, and partly because it is marketed as a personal research tool for the consumer. The DTC genetic companies are providing a service for individuals to obtain the personal information that already exists within their DNA, so technically they are not selling a drug or homeopathic remedy. This type of at-home genetic testing has been compared to over-the-counter pregnancy tests in that it only provides the person with information about their own body. Proposals have been made by the government, FDA, and the medical community to regulate DTC genetic testing companies, but standards for operation have not yet been established. Core issues include what conditions or diseases should and shouldn’t be reported to the consumer in the absence of a medical professional, how the results should be presented to the consumer, the reliability of the information that is being given, and how much counseling should be provided in conjunction with the results.